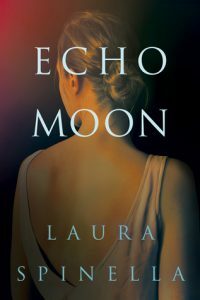 Echo Moon finishes the Ghost Gifts trilogy, beginning with Aubrey and her souvenirs from ghosts she helps that she calls “ghost gifts,” through her marriage to journalist Levi St. John, to their son’s story of his past life, wherein he envisions shooting his true love Esmerelda Moon—Esme. Spinella pulls the reader into an early 20th-century culture of supper clubs and amusement parks, showcasing Luna Park of Coney Island, with its rides, performers and customers. We even witness the shadier “rides,” “performers,” and “customers” of the Elephant Hotel, a brothel set on the edge of the park. The hotel is real, but turned brothel after the heyday of the family-oriented park, and pulls Spinella’s story into the historical fiction genre as she carefully blends it into her novel. In Ghost Gifts, Aubrey solves the mystery of Missy Flannigan’s decades old, cold-case murder with a recalcitrant Levi St. John, and they reluctantly fall for each other. In Foretold (Ghost Gifts #2), Aubrey and Levi are raising their son Pete, who suffers nightmares that are actually visions of his previous life as a photojournalist in WWI. The investigation of a John Doe (who turns out to be Aubrey’s friend Zeke) murder in which Levi is assisting culminates in the kidnapping of Pete, who is of course rescued by his parents. In Echo Moon, Pete finally solves the murder of Esme, with the help of Zeke’s niece Emerald—Em. Spinella spins coincidences into relevant evidence and drops the solution out of nowhere, but it all makes perfect sense. She has a way of surprising the reader without making the reader feel dumb for missing clues, and her characters are colorful and complex. I received an early copy of Echo Moon from the publisher in a giveaway. Thank you, Laura! I love it! Visit her website to follow her on social media and purchase her books. Tell me a personal experience with the paranormal in the comments, and I’ll choose a random winner to send my ARC of Echo Moon!